Go beneath the ocean waves with this lovely 25 payline slot. 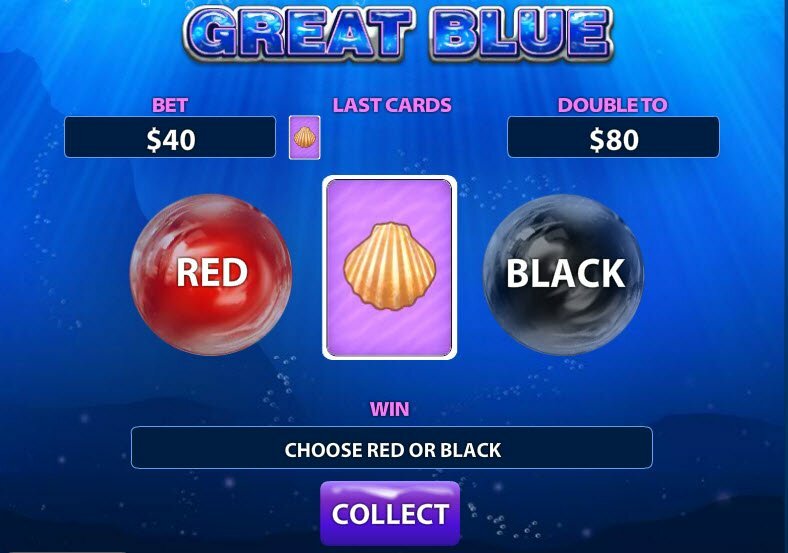 The Great Blue Slot contains both a Bonus Game and a Gamble Feature where you can win cash prizes, Multipliers, and Free Spins instantly. Enjoy the lovely images of fishes, sea turtles, sharks, orca whales, star fish, and sea shells while you play. Playtech blows it out of the water with this one. 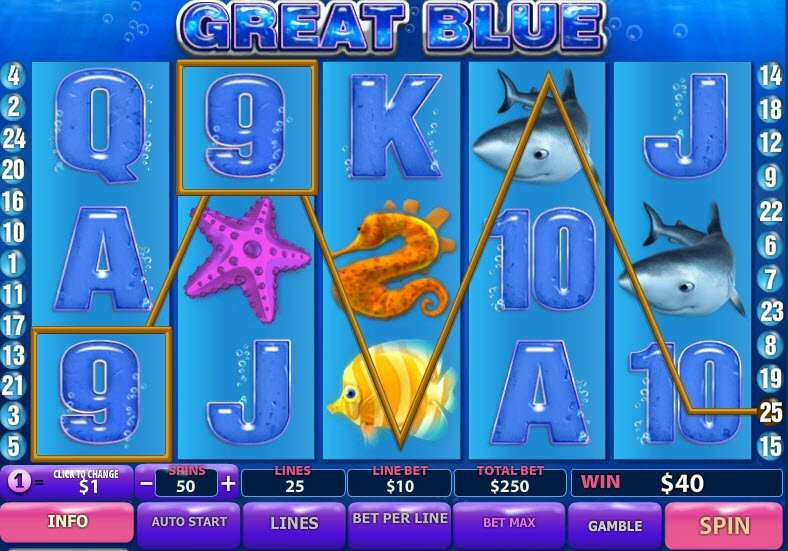 The Great Blue Slot contains 25 paylines and beautifully crafted graphics. The game also includes a great Bonus Round which awards up to 33 Free Spins or up to X15 in Multipliers. During Free Spins, you can earn an infinite number of additional Free Spins. Cute little sea turtles and graceful seahorses all swim the reels of The Great Blue Slot. The soft colors make this game appear pleasant and artistic. You’ll also see lovely fishes and pretty pearls along with killer whales and sharks. The graphics look nice, but they’re not very sophisticated. They don’t animate during winning combination as is the case with other, better quality 3D Slots. While you play the game you’ll hear water bubbling which gives you the feeling of floating under the sea. As the reels spin, steel drums play. Sit back and enjoy the aquatic atmosphere of The Great Blue Slot. When 3 or more Pearl Symbols land on the reels, you automatically win 8 Free Spins with X2 multipliers. During Free Spins, you can win even more Free Spins infinitely. The Great Blue Slot has a few rewarding bonus features that give larger payouts, Free Spins, and Multipliers. The killer whale represents the Wild Symbol. It substitutes for all symbols except the Scatter and doubles all payouts. The Pearl serves as the Scatter Symbol. By far the most valuable symbol of the game, land on this bad boy and you could win up to 33 Free Spins or up to X15 in Multipliers. 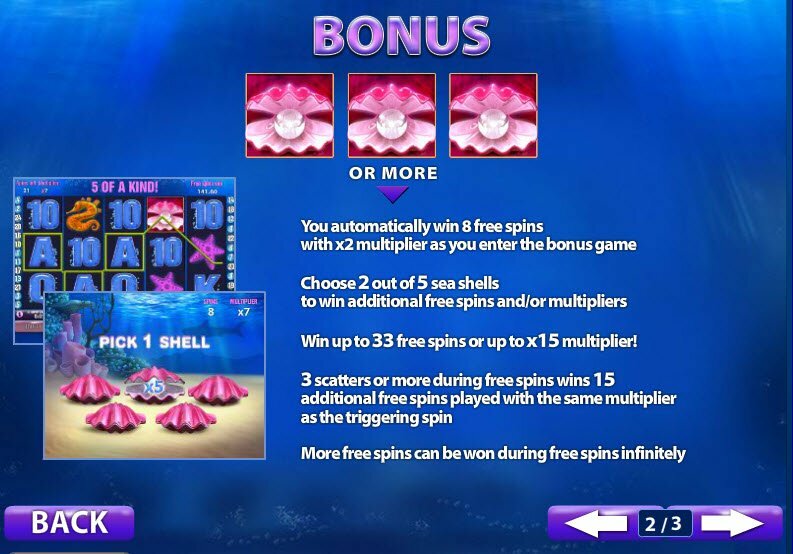 When 3 or more Pearl Symbols land on the reels, you automatically win 8 Free Spins with X2 multipliers. During Free Spins, you can win even more Free Spins infinitely. The Pearl also grants you access to the Bonus Game in which you choose 2 out of 5 shells to win additional Free Spins and/or Multipliers. The Great Blue Slot Bonus Features also give you the option of putting your winnings on the line. After each winning combination, you may enter the Gamble Screen in which you bet money to guess if the next card will turn out red or black.